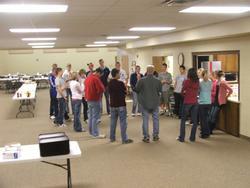 Young Peoples (or Youth Group) includes students that are in High School (9th through 12th graders). Young Peoples meet on the 1st and 3rd Sundays of the month during the educational year in the multipurpose room after the evening service from 7:30-8:45PM. There are also many group activities available to the students during the year for extra time of fellowship and relationship building, including service opportunities.